The broke government has so far spent $500 000 funding the process of renaming Harare International Airport after President Robert Mugabe, the Daily News has learnt. 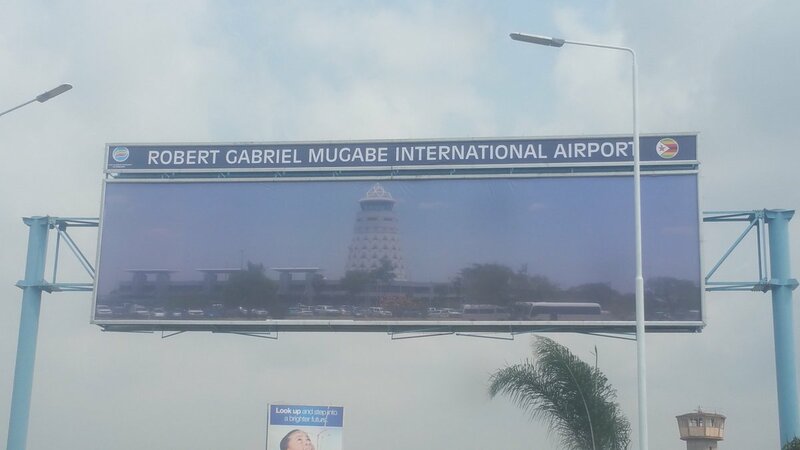 The airport officially assumes its new identity — R G Mugabe International Airport — today. According to a written briefing, which Transport and Infrastructural Development minister Jorum Gumbo submitted to Mugabe last week, it has also emerged that Mugabe’s office took over the renaming process last month and elevated it to national project status in order to qualify it for government funding. Until then, the process was being handled by Gumbo’s ministry. The staggering half a million dollars funding was approved by Cabinet’s committee of place names chaired by Defence minister Sydney Sekeramayi. In the briefing, Gumbo said: “Your Excellency, in recognition of your contribution towards the liberation of the people of Zimbabwe, the ministry of Transport and Infrastructural Development is now implementing the resolution from the Zanu PF Victoria Falls conference to rename Harare International Airport in your honour. “In order for the process to be supported by international stakeholders, assurances and comprehensive input from local stakeholders was sought. Cabinet approval for the name change was sought and granted,” a copy of the briefing reads. According to the briefing, Treasury paid $300 000 to the surveyor general’s office, while the remainder — $200 000 — will be spent on funding today’s unveiling ceremony. “The (Cabinet) committee came up with a comprehensive budget, factoring in input of local and foreign stakeholders. “To date, $300 000 has been availed to the surveyor general by the ministry of Finance and Economic Development for the change of aeronautical maps,” Gumbo informed the 93-year-old Mugabe, adding that a “further $200 000 has also been availed for preparations for the event”. An aeronautical map is a chart designed to assist in navigation of aircraft, much as nautical charts do for watercraft or a roadmap for drivers. Using these charts and other tools, pilots are able to determine their position, safe altitude, best route to a destination, navigation aids along the way, alternative landing areas in case of an in-flight emergency, and other useful information such as radio frequencies and airspace boundaries. “The Civil Aviation Authority of Zimbabwe got clearance from the International Civil Aviation Organisation (ICAO) and has already notified stakeholders of the name change to be effected on November 9, 2017,” the write up further reads.